Dundee United assistant manager Simon Donnelly played down the significance of the defeat by St Johnstone ahead of their Scottish Cup final meeting. 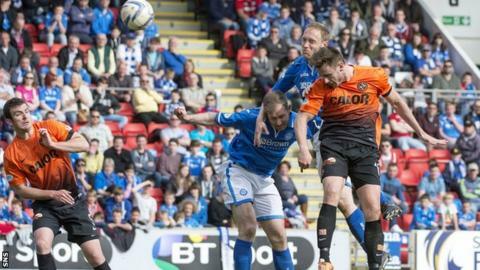 Saints won the Premiership encounter at McDiarmid Park with goals by Steven Anderson and Stevie May. "That's four weeks down the road," Donnelly said of the cup final. "We can play a lot better than that. Our focus today was on three points. Unfortunately today, the cutting edge wasn't there." The result dented United's hopes of finishing third with the Tangerines now seven points behind Motherwell. "Just disappointed obviously," added Donnelly. "We came here trying to get another three points to keep our challenge on the two teams above us alive and we've not got that. "We didn't start the game particularly well and St Johnstone managed to get their noses in front. In these types of games, the first goal is very important. "We got a reaction at the start of the second half and we had a couple of chances but St Johnstone have hit the post twice."